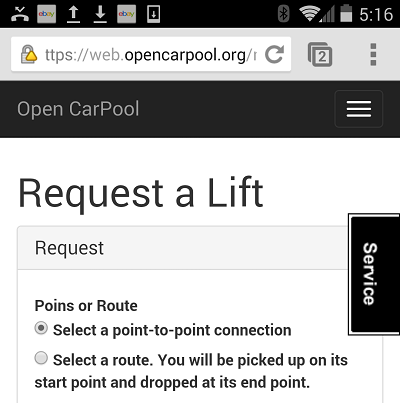 How can I request a lift via a the Web on a computer or smart phone? Alternatively you can also click the “offer a lift” link or select “Passenger” > “Request a Lift” in the menu. your start and end point (recommended) from the available pick-up points - either from the drop down lists or by clicking on the respective pick-up points on the map. You might want to zoom in first. As a start point select a point close to your home. If there is none close by, contact us via the Service tab on the right side of the page to request one. The end point is usually the office location when you drive to work - or after work vice versa. ... or select the route on which you’d like to take. And if applicable check the box at “I drive the route in reverse direction”. Enter the departure time in 24-hour format. This defines the time window in which you'd like to depart from your start point. Select the date on which you’d like to request the lift. Click on "request ride" to submit your request. After you submitted your request, the system will show you potential drivers who pass by your start point in time window you entered. You may also receive a SMS text message or an email with the names and contact data of matching drivers. In case a driver will offer a lift after you have submitted your request, the system will also notify you about the new matching offer via SMS or email. In case there are matching drivers for your request: contact the most suitable one directly via cell phone or email to arrange a pick-up. Hint >> The lift request you submitted is a one-time request only valid for the time and date you specified. It is not a recurring request for multiple days. If you want to request a lift for multiple days, you can do this conveniently using your Outlook(TM) calendar, see help page "How Can I Request Lifts via my Oulook Calendar?" at https://opencarpool.zendesk.com/hc/en-us/articles./201007956.